Secretary Pritzker and U.S. Trade Representative Froman, along with a high-level Government of China delegation led by Vice Premier Wang Yang, kicked off a day of side events with American and Chinese private sector leaders around the Joint Commission on Trade and Commerce (JCCT). For the first time, the JCCT schedule included a full day of events designed to facilitate private sector engagement with officials from the U.S. and Chinese governments. Thirty-one years after the JCCT’s inception, Secretary Pritzker, Ambassador Froman and Vice Premier Wang Yang committed to re-imagining the JCCT. Their hope is for the JCCT to serve as more of a platform for government leaders to hear from the business community, as well as continue to serve as a forum for addressing bilateral trade and investment issues and promoting commercial opportunities between the United States and China. In the morning, both delegations participated in a roundtable with 24 business leaders from the U.S. and China, sponsored by the Paulson Institute and the U.S. Chamber of Commerce. During the roundtable discussion, government and business leaders discussed the opportunities and challenges of bilateral investment between the United States and China, including greater market access for U.S. goods and services, protection of intellectual property—including trade secrets—as well as ways to promote an efficient and level playing field in China, and how to secure best practices in regulatory enforcement, among other issues. 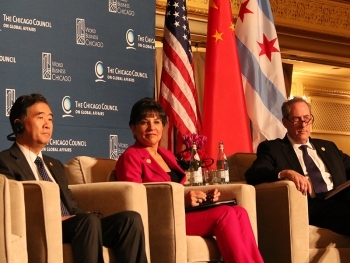 Later in the day at a luncheon hosted by World Business Chicago, Secretary Pritzker emphasized the importance of global commerce in promoting more openness, trade, and business between the United States and China. She also highlighted how Chinese investment in the United States has been a win-win for both countries and noted that Chinese investment has grown 42% between 2009 and 2013, supporting jobs for 14,000 U.S. workers. Secretary Pritzker finished the day speaking about the shared vision of a global economic partnership that exists between the United States and China. She noted that the success of the U.S.-China commercial relationship is critical to global economic growth and stability. The two economies are the largest in the world, accounting for nearly 35 percent of global GDP. Combined U.S. and China trade in goods and services add up to about one-fifth of all international trade, so the importance of the bilateral economic relationship to each other and to the global economy cannot be overstated. In many ways, the reimagined JCCT is an opportunity for the JCCT co-chairs to build a legacy of cooperation, respect, and stronger U.S.-China economic ties. Leaving this legacy will require a tremendous amount of work, but if it succeeds, the JCCT will become an even more effective mechanism for economic growth. The co-chairs can use the JCCT to promote more commerce, to deepen trust, and to address real business challenges.